Welcome to some more Star Citizen, Red Bull Gaming have a series looking at various games and game studios… one of these was titled “Biggest crowdfunding campaign in gaming history – Star Citizen | Levels” I wanted to highlight a couple of bits here as concepts for animals were shown are are cool. 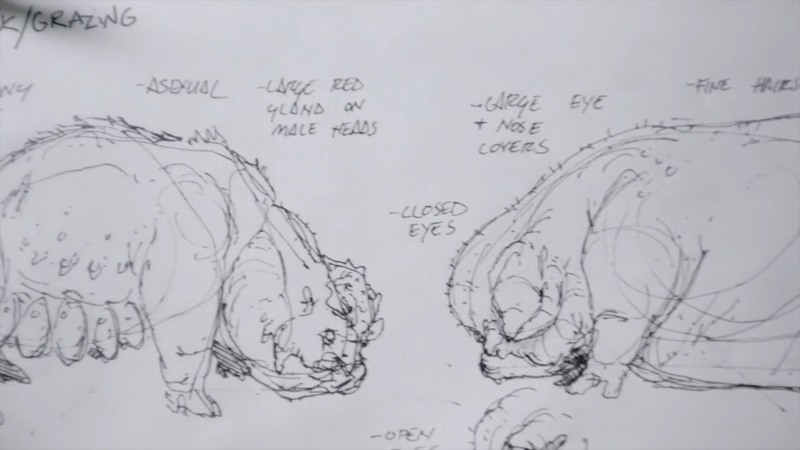 The main thing I want to talk about are a few seconds of Animal Concepts that were shown. Top right you can see the Xiphopods that were seen in the CitizenCon 2017 gameplay demo on Hurston, they are basically like rats but… fly and are originally from Leir or at least that’s where they were first discovered, that might sound familiar because Leir III was from the procedural planets v2 demo and contained the mighty Sandworm. The words heat sensitive, flying, slow moving, hummingbird, slow moving and fast attack are written. Back to the picture though in the bottom right we can see a flying terradytal type creature which might be a variation of early version of the Tokyai, a Xi’an Apex Predator that the Santokyai was named after. On the Bottom left an animal that looks like a cross between a graboid in tremors and a dog/rhino. Variant faces below like a goat bird. You can see the words No eyes, Large Crushing Claws, Size of a Bison and Omnivore. At the top left appears to be more evolutions of this creature, walking/standing, but the words elephant. The next picture contains from top left to bottom right a Gorilla type aliens with tusks and a massive stance, that charges at prey. Then there is a head of a more lizardy rocky scaled with a large tusk/tooth underbite. It appears to have snake like claws. Below appears to be a crocodile type creature but very bloated that shares many of the same features. 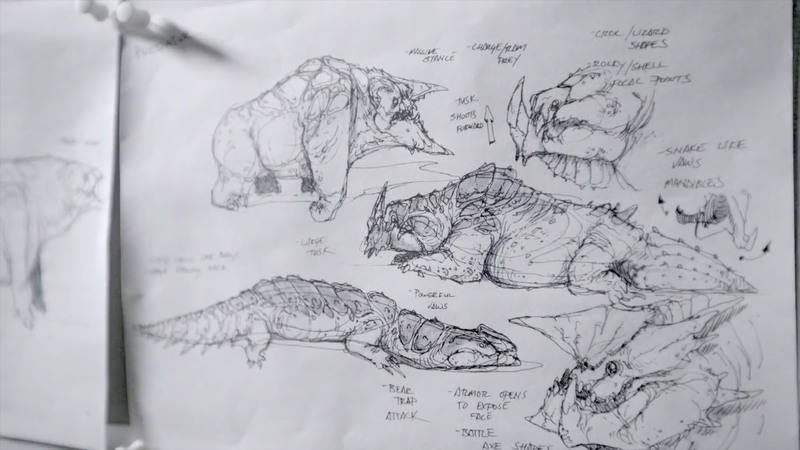 Below this on the on the left is an even more crocodile type creature with a bear trap attack, I expect these were envisioned to be in long grass or in swamps and would have players accidentally step on them for a nasty surprise, with it’s armor opening up to expose its face. 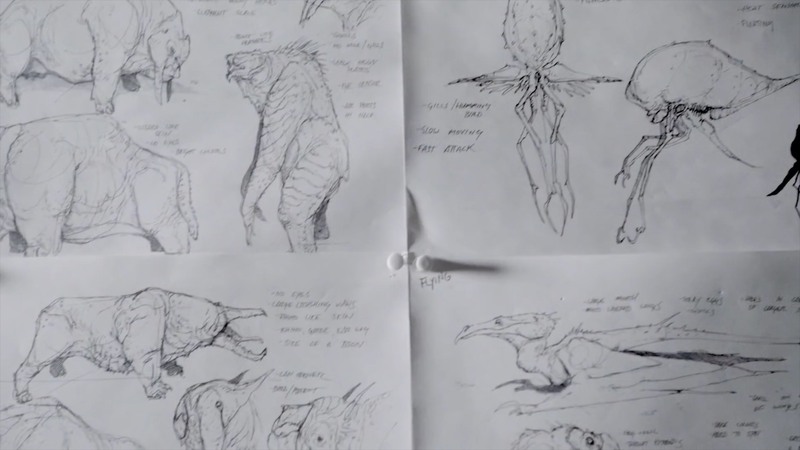 Bottom right has another armored dinosaur type alien creature… which again is likely a variant for the creatures shown above. The last picture is more of a pig/boar type animal. With the words, Livestock, Grazing, Eggs hang from under, asexual, large red gland on male heads, large eye, nose covers, closed eyes & fine hairs. It’s good to see that there are a few animals in the works, obviously they’ll want some more robust fps ai in before they tackle animals and their pathfinding around planets but we could see some more simple creatures like the Xiphopods before that I suppose. I’ll do a quick summary of the rest of the Red Bull vid, it goes over the basic story and intention of Star Citizen. The have to build a culture and lore for each of the animals and aliens in game. For Chris Roberts, Star Citizen is like a 2nd life in space rather than something you can win/lose at. There is no way a publisher would of back the game originally, but the crowdfunding of Star Citizen has been massively successful. They get to engage the community and get feedback on the project and iterate based on that. The Game has an unprecedented amount of precision and scale. They have 100 star systems outlined each with 3-4 planets each, originally there weren’t going to have fully explorable planets. They are working on working out what “time” means in game will they use a local time OR absolute UEE Time. All their actors are scanned, they are currently playing with potentially doing individual hairs on their characters, I think they wanted to use some form of spline tech, this will be based on whether it’s viable or not performance wise though. They see themselves accountable to the backers and acknowledge there is a thin layer between the game, devs and community which means when things go wrong they are very visible. There was a little behind the scenes of CitizenCon 2018, just them getting things ready for the presentation and setting up. Chris said he liked the fact the gameplay was live and some bits rough around the edges… because it’s real & they don’t want to look like a big publisher. The game will be reactive and evolve, they expect players to do lots of unexpected things. Please checkout the full video in the description and links below. Can we have more info on those “automated gimbal mounts” mentioned in the roadmap? will you be able to explore all of arc corp by ship, or will it mostly be restricted fly zone except for area 18? I’d like to know more details about the “Groups System Improvements v4”. What is the plan to increasing player count in the PU? 50 players distributed across millions of KM is making the game feel a bit empty. What is the status on the item insurance (weapons, components…) ?